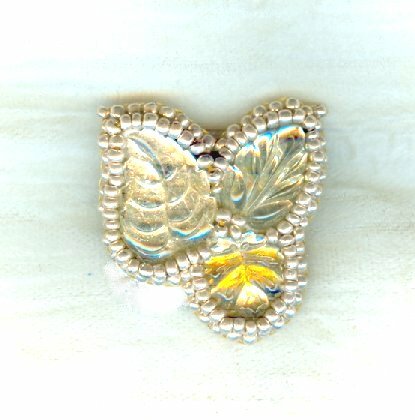 Three pale yellow vintage West German glass leaf-shaped stones are bonded to a backing and surrounded with light gold toned seed beads. The Very Last Word in charming, this little brooch measures just 1-1/4 inches wide by 1-3/8 inches long. Lovely, affordable and a wonderful gift; must be from SPARKLE PLENTY. All our one of a kind and limited edition artisan beaded jewelry is individually handcrafted in our studio in Los Angeles, California. Be sure to browse our online store to see all our bracelets, necklaces and earrings and other fashion accessories. All designs, text and photos copyright Sparkle Plenty Fine Beaded Jewellery 2002-2010 and may not be reproduced in whole or in part without prior, express written permission. All rights reserved.